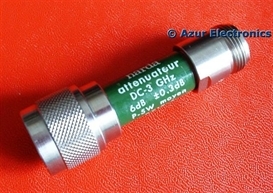 An attenuator decreases the level of signals. This is essential when strong signals need to be investigated or used to drive other equipment without overloading or damaging the input. I currently have 12 attenuators, 11 fixed and 1 variable, although other items such as power splitters and bridges also contain attenuators. It is important to know both the attenuation in dB's, the operating bandwidth and the power dissapation. 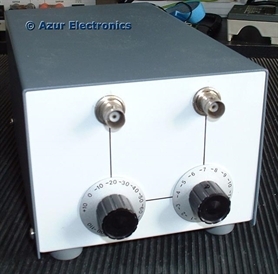 Azur ATN105 RF Attenuator providing up to 132dB of attenuation in 1dB steps. 50Ω BNC Connectors. 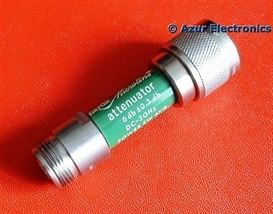 For details see ATN105 RF Attenuator. Narda 773-30 Attenuator providing 30dB of attenuation from DC to 6GHz. 50ΩN-type male to female connectors. DC to 3GHz ±0.3dB and 3GHz to 6GHz ±0.5dB. 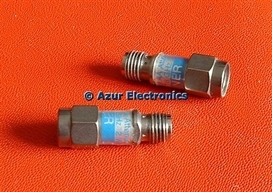 2 x Radiall R 412406 6dB Attenuators, 50ΩBNC male to female connectors. 1 x Radiall R 412410 10dB Attenuator, 50ΩBNC male to female connectors. 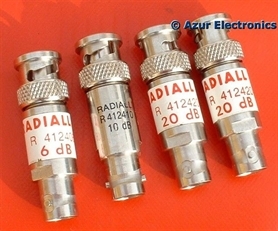 1 x Radiall R 412420 20dB Attenuator, 50ΩBNC male to female connectors. Narda 771-6 6dB Attenuator 50Ω 2W DC to 3GHz N-type male to female. Narda 771F-6 6dB Attenuator 50Ω 5W DC to 3GHz N-type male to female. 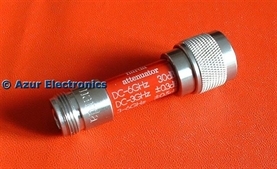 2 off Suhner 6620.19.AA 20dB Attenuator 50Ω 2W DC to 18GHz SMA male to female. HP 11708A 50MHz Reference Attenuator 30dB N-type male to female. For use with HP 8484A Power Sensor, see Power Meters for details. 2 off HP 0955-0826 6dB Attenuators. 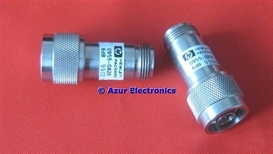 Originally from Agilent E4402-60009 Accessory Kit, these Attenuators are 6dB DC to 18GHz 50Ω N-type male to female.